Hey there! I didn’t mean to be gone for so long, but you know…life happens. I’m glad to be back in time for the holidays…so much to do and so little time! I dusted off my sewing machine this week and broke open this fat quarter bundle of Milk, Sugar and Flower fabric I bought back in February. It looked so pretty on my shelf it was a bit painful to actually use it. I used the Yellow Brick Road pattern by Atkinson Designs. It’s an oldie but a goodie. Looking back I wish I would have thrown in some solids, or some more saturated small prints to break it up a bit. Also I would have thrown out the orange. Sophie loves it to pieces and that’s what matters, plus the prints are so darling and dainty. I found a little bit of the fabric still for sale (and on sale!) here. Just as I was getting ready to press this quilt top for the last time the power went out…for 2 days. So it still needs some ironing. Instead of me going to Houston Quilt Market this year we took a family vacation to Hawaii. It was heavenly just to be there with nothing to do except play with the kids and explore. We are lucky to have family that live there and have room for us to stay with them! Ben is obsessed with fishing and fish and everything fish related, so Jay and I were super excited to take him snorkeling for the first time. We briefly showed him how, and a few minutes later he popped his head out of the water and said “Mom….this is BLOWING MY MIND. Thank you for bringing me here to see this!”. Then he snorkeled for 2 weeks straight. One of the best things about being a parent is sharing amazing things with my kids for the first time and seeing their joy and amazement… even when it’s not as cool as snorkeling in Hawaii. I hope you are all having a wonderful start to your Holiday season and I’ll be back soon…I missed you, and blogging!!! 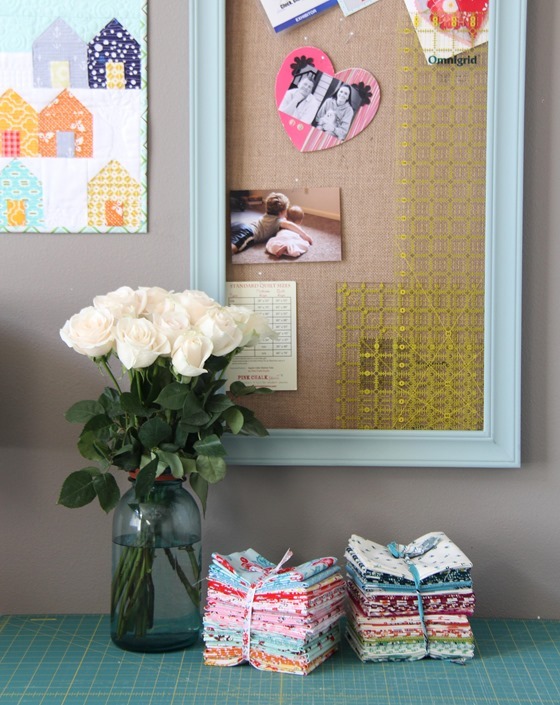 I love it – I actually love that there are no solids to break it up and I love the orange! So there! haha! Hawaii looks great, it is on my list for when I turn 40 in 2021! 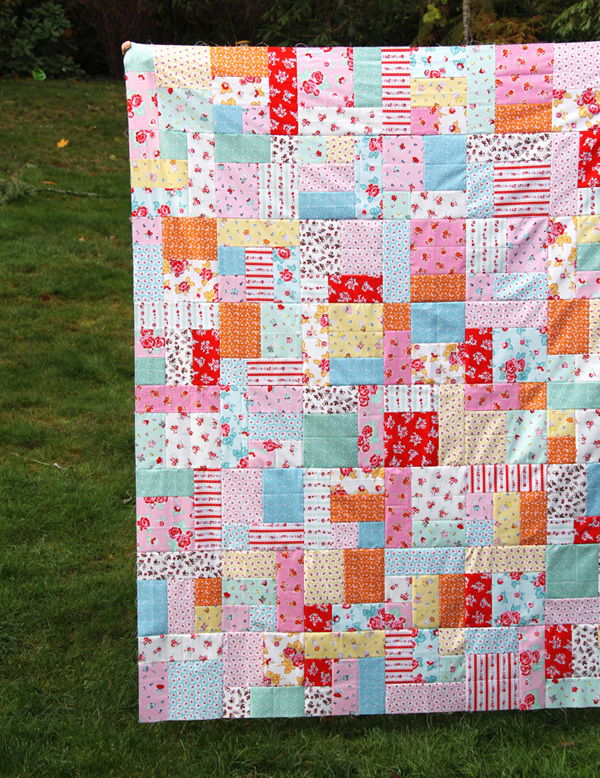 Your quilt is lovely and the orange (and red) give it a ‘pop’ of color. Cuddly and sweet – extra special for your daughter. Beautiful pictures of Hawaii. Had to laugh at your Son’s enthusiasm – yes those memories are special! It’s beautiful. I love it just the way it is. Sharing those moments with children is priceless. Hey there! Missed you too. Your blogs are a pretty good high light of my life right now. I love the colors in the quilt. Those beach scenes are so inviting. I can almost feel the air as I look at them. Hawaii is a great place for snorkeling. Your quilt is beautiful in those fabrics. beautiful quilt! Love the family vacation, sounds like it was the perfect choice! Thanks Anna and love your new pattern!!!!! Darling! I find myself going back to tried and true patterns again and again. This has such a fresh look. Well done and welcome back. So good to hear from you again! You’ve been missed! What caught my eye was the edge of a wall quilt of little houses so I searched your blog for the pattern. I didn’t find the exact quilt which is the size of blocks I’d be interested in. Do you have a pattern available for it? Thanks! Beautiful quilt! I’ve missed your blog and Instagram posts. I’m glad you got to enjoy family time in Hawaii! Oh, your quilt is JUST wonderful!! I love it so much. You did a fabulous job, as always!! 2 days is nothing for us Helen! We live surrounded by tall trees, so we are pretty prepared for power to be out during the winter many times for a long time! 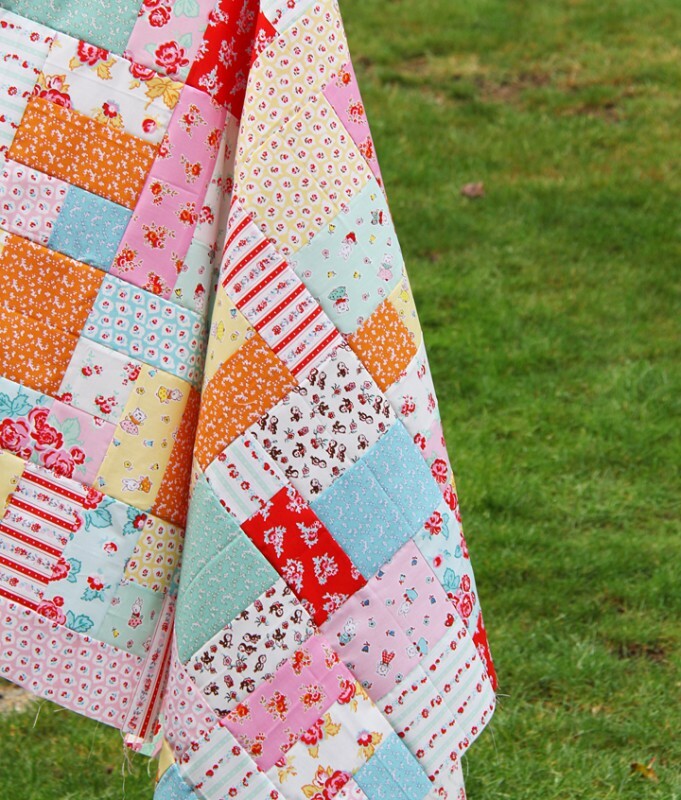 That quilt is so cute Allison – I love it exactly the way you made it, orange fabric and all! It looks like you and your family had the most marvelous vacation together in Hawaii. 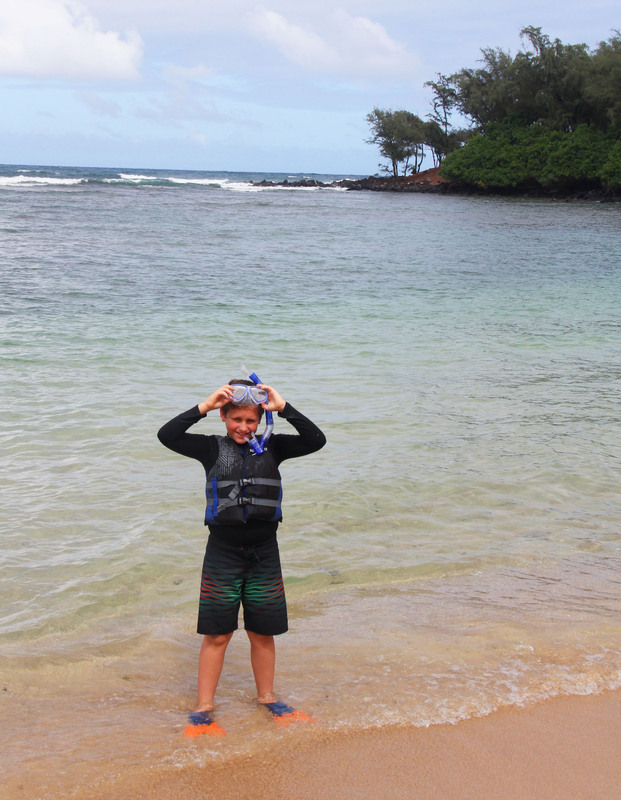 Your Ben’s reaction to snorkeling is just the best! really liking this quilt design must check out how to do it. Loved the tale about your son and the snorkeling, he will be asking when are we going to Hawaii again and pestering you! I absolutely love snorkeling and I am 70 years old. Your quilt turned out cute. I like it just as it is. It has a very vintage feel to it. Your quilt is darling! It is light, airy and cheerful and the orange fits perfectly. It’s a beauty! Five years ago I took a My First Quilt Class. After the class was over, I remade the class quilt in another color scheme and then asked my teacher to suggest another pattern. She suggested Yellow Brick Road. Since then I’ve probably made five of them. It always looks different depending on the colorway and fabric choices and there’s very little waste. Plus it’s easy on the brainwaves to sew! Good job! Love the colors in your quilt. In fact, I loved the pattern too and went looking for it. Found it and it’s arriving on Monday. I already have the perfect fabric for it. Yea me. Just made this in flannel. Love the pattern.